BEIJING, Sept. 10 (Xinhua) -- China's top political advisor Wang Yang on Monday called on China and Uruguay to advance bilateral cooperation to a new level. Wang, a member of the Standing Committee of the Political Bureau of the Communist Party of China Central Committee, and chairman of the National Committee of the Chinese People's Political Consultative Conference (CPPCC), made the remarks during a meeting with Uruguay's Vice President Lucia Topolansky, also President of the General Assembly and President of the Senate. 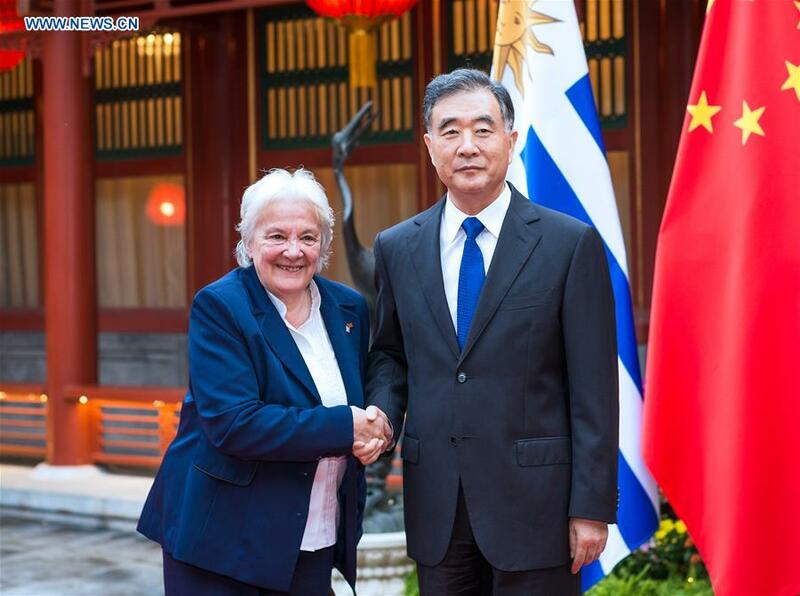 Wang said China and Uruguay have always treated each other equally with mutual respect, and bilateral relations have maintained stable development since the establishment of diplomatic ties 30 years ago. He called on both sides to implement the important consensus reached by the two heads of state, jointly promote the Belt and Road construction, and strengthen the docking of development strategies and cooperation plans in order to enhance bilateral cooperation to a new height. "The CPPCC stands ready to work with the General Assembly of Uruguay to strengthen exchanges and cooperation so as to make new contributions to the development of China-Uruguay relations," Wang said. Topolansky said China has been the largest trade partner of Uruguay for many years, and Uruguay is willing to deepen the bilateral ties, and enhance governance, people-to-people exchanges with China.